Beautifully engraved Certificate from the theglobe.com issued. This historic document was printed by the American Banknote Company and has an ornate border around it with a vignette of the company's name and logo. This item has the printed signatures of the company's officers. theglobe.com was home to games.theglobe.com, a leading interactive entertainment and games information resource geared toward game enthusiasts of all ages and levels of expertise. Visitors to any of games.theglobe.com's properties could read timely game reviews, special features and industry news, get the latest tips and cheats, download demos of new games before the full versions hit store shelves, play exclusive multi-player web games, enter contest promotions, and even purchase the hottest new games software. games.theglobe.com was comprised of the following wholly-owned properties: Happy Puppy (www.happypuppy.com), Games Domain (www.gamesdomain.com), Games Domain Offline, Console Domain (www.consoledomain.com), Kids Domain (www.kidsdomain.com), Computer Games Online (www.cgonline.com), Computer Games Magazine and Chips & Bits (www.chipsbits.com). 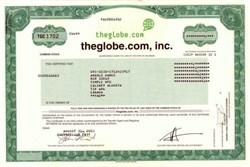 Unfortunately, after six amazing years, theglobe.com closed its doors on August 15, 2001.